The below is taken from Maya Turovskaya's book 7½, ili filmy Andreia Tarkovskovo, "Iskusstvo", Moscow 1991, ISBN 5-210-00279-9. Another Artemyev interview about Stalker and other films by Tarkovsky can be found at Electroshock Records. On the whole Andrei Arsenevich worked in a way that was most unusual compared to the other directors I met. For example, he never showed up at the recording sessions. Once I asked him: "What, doesn't that interest you?" — "Well, this is not a concert. For me it's important how the music combines with all the components in the picture: image, speech, real-life noises. Then I can decide whether it fits or not. Otherwise I could make a mistake, I might like something but it won't fit the shot." But no, in one instance he did come to the recording. This was during Stalker when we felt we couldn't communicate our ideas in words. At that time he was fascinated by Zen Buddhism and I was also getting interested in it, in a different way — by way of music. We swapped Pomerants's lectures. And Andrei suggested: "You know, I need music that would sort of unify the cultures: East and West". I had no idea how to do this. I tried to introduce an Eastern instrument. Then something purely electronic, some unreal image (Zen Buddhism — that's like opening of the "I" into the universe) — that didn't work either. Then one day I showed Andrei a 14th century Catholic melody called Pulcherrima Rosa which, in my opinion, contained some very important traits from Western musical culture — the graphic clarity of the melody, the deeply restrained spiritual setting, and a well-balanced logic where nothing is left to chance. I remember how intently Andrei listened to it several times, extremely attentively. Then after a somewhat long pause he said: "Yes, this is clearly what we need but it's necessary to find a way to express it in a new form, perhaps only hinting at it, retaining only the instrument..." (the main theme of the piece was performed on the recorder)... Then after another pause: "Well, but this is only a part of the problem, and what about the East, how to unify this music with it?" At this moment I thought I understood everything and the only thing left to do would be to take any Eastern instrument, write something accompaniment-like for it — and everything would follow automatically... But nothing came out of that mechanical join. Fortunately, this was the only one time when Andrei showed up at the recording session! Attentively and saying nothing, without making a single remark, he sat through the entire four hours (we recorded something like 20 minutes). After that he took me out to the corridor so nobody could hear us and said: "Old man, none of this fits but at least now we both know this is a wrong approach and this kind of experience doesn't come cheap". This kind of experience doesn't come cheap. The content of this conversation remained unknown to the musical editor, the producer, the conductor. This way he saved me from the trouble that would inevitably follow, and the musicians having signed the time sheets were not deprived of their compensation. I should mention that failures at recording sessions do happen but they always happen under circumstances leading to big scandals etc. I was very upset by what had happened and being fully aware of the scope of the failure I had no idea how to solve now such a difficult problem. It was Andrei himself who helped me by saying: "Let's search for the key in the visual sphere. For example, we'll present an image of space frozen in a dynamic equilibrium". 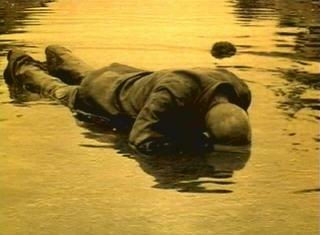 Stalker's dream and the opening titles. And then the following idea occurred to me: I mentioned an Indian musical piece with a constant, stubbornly unchanging tone which to my mind brought an impression of strained frozen space. This was the solution! I created an aural-acoustic space on the synthesiser which was spectrally close to the timbre of the Indian instrument tampur. And this aural space immediately unified what seemed impossible: acoustic instruments of East and West (the tar and the flute) and the stylistically countering thematic material. Now it all appears elementary but the elementary is the most difficult thing in the world to find. I was wandering all over in search of solution, the film was complex, many layers, and its idea was not verbal but pictorial. It was never easy for me to work with Andrei Arsenevich also because he'd say: "See the film for yourself, in such-and-such episodes there definitely ought to be music and as for the rest, I don't know, choose something yourself". I made selections and then during the dubbing sessions he'd sometimes retain just one episode out of ten. That was truly a process of creative filmmaking.